Leaving from Basel (due to the car window fiasco) rather than Fribourg allowed us to drive over a different and beautiful part of the Alps. 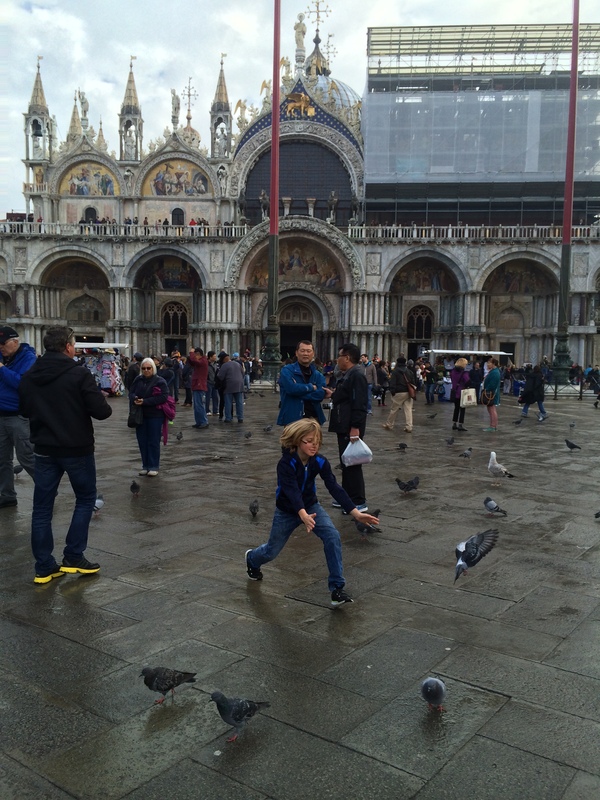 (See here for ITALY PART I – contact me to plan a trip like this). MILAN. Well, sadly we didn’t manage to get into Milan itself, given our delayed departure, but we had a thrilling start to the trip anyway. 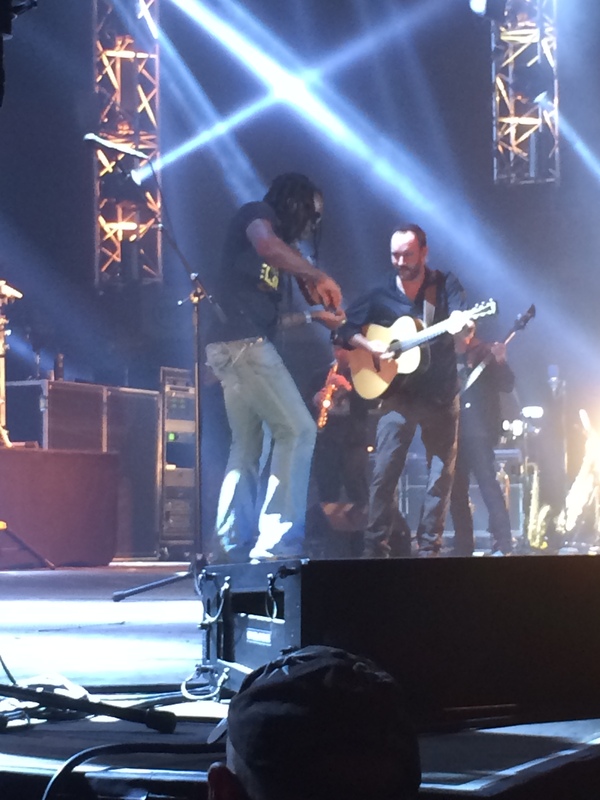 We were able to catch one of our favorite bands in concert – the Dave Matthews Band – and lucked out big time. Full of impressive talent, the band always puts on an energetic and fun show. We were able to see the band members up close as they came on and off the stage, and several of them fist-bumped, shook hands or even hugged the boys… and in doing so, created two new fans-for-life. 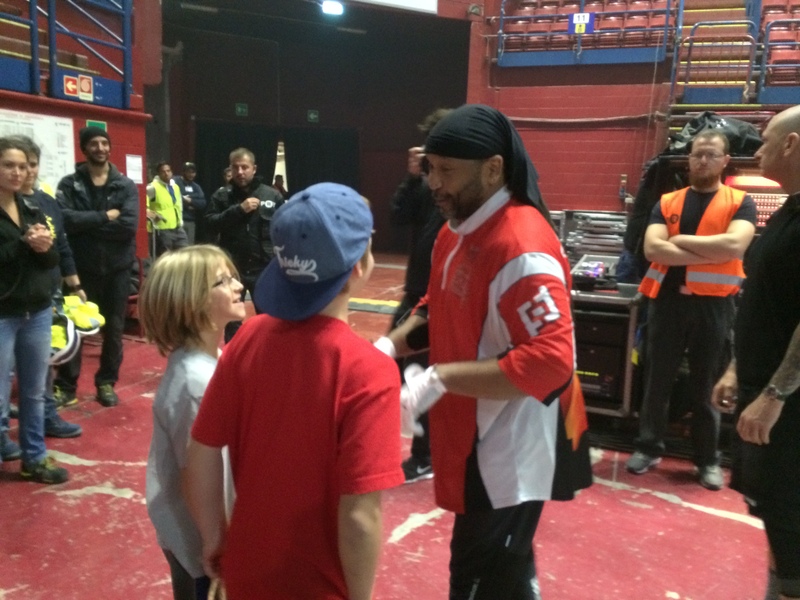 The drummer, Carter Beauford, was especially kind and generous – he went out of his way to chat with them and gave them each a pair of his drumsticks. Really special. The rest of Milan will have to wait for another visit, as will Verona, which we had to cancel this time when the concert opportunity arose. We will get back to those two cities! VENICE. What a beautiful place… but what incredible Disneyfication. We managed to enjoy it in spite of overpriced everything, hordes of tourists and (understandably but disappointingly) unfriendly locals. Yes, it was REALLY crowded even in the middle of October. It’s possible to get away from them if you are willing to get lost in the back streets. It sounds silly, but I really wished I had a compass! That would have allowed us to stay off the main drag (which has occasional signs) but still go generally in the right direction. Weekday evenings were better too. 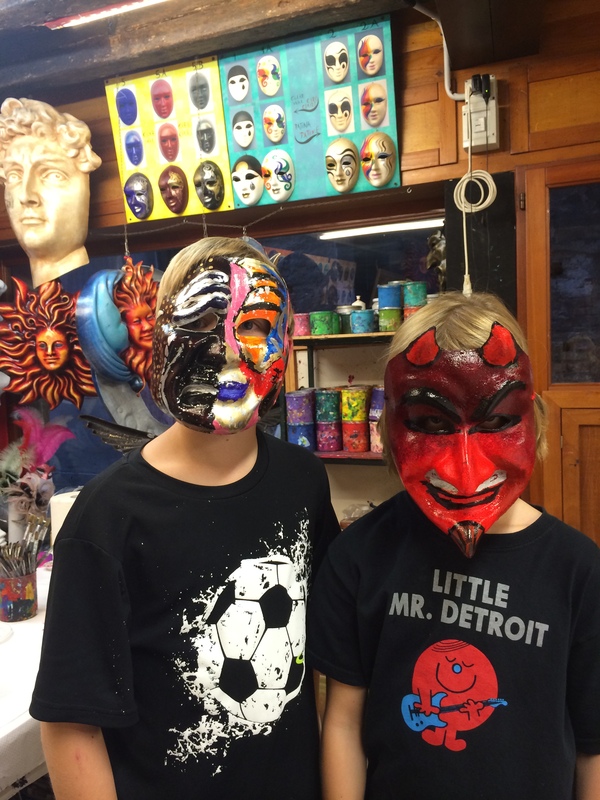 The best thing: the kids painted masks at Ca’ Macana – they really loved this. That said, you can’t reserve it until the day-of unless you are part of a tour group, and the staff was not very friendly, but regardless, this was really fun and gave them a neat souvenir. 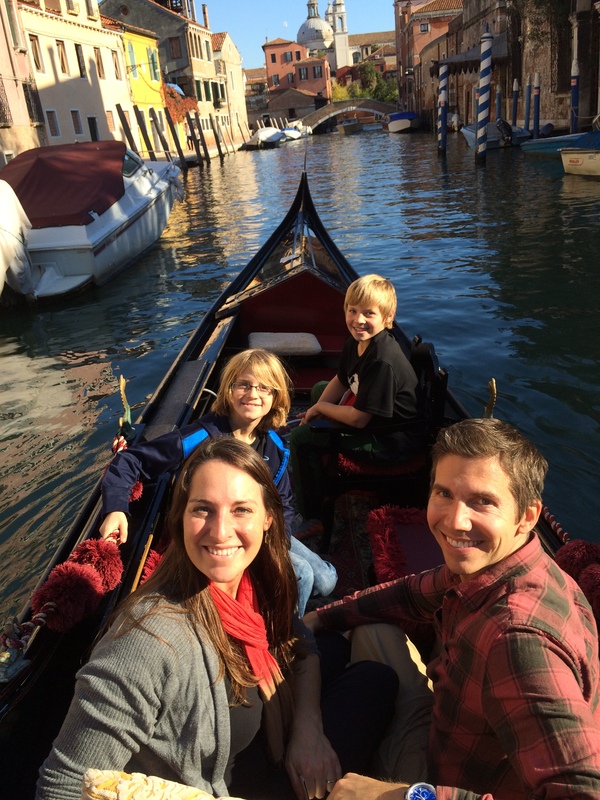 We also bit the bullet and did take a gondola – it was very pleasant, it’s a set price (albeit exorbitant) so we knew what we were getting into, we had a nice gondolier and we would have regretted skipping it. Just a few days before the trip, I decided to go ahead and book us on the so-called “Secret Itineraries” tour of the Doge’s Palace (Palazzo Ducale) – it was only a few dollars more than a regular ticket, allows you to get in without waiting in a long line, gets good reviews and you get to see parts of the palace not allowed with the regular ticket. It was worth it – the guide was good and told some great stories, particularly about Casanova, who was imprisoned there for well, pretty much for what you’d think (involving other people’s wives), but he made a dramatic escape. We all enjoyed the tour, but honestly, it was mostly worth it to skip the line. 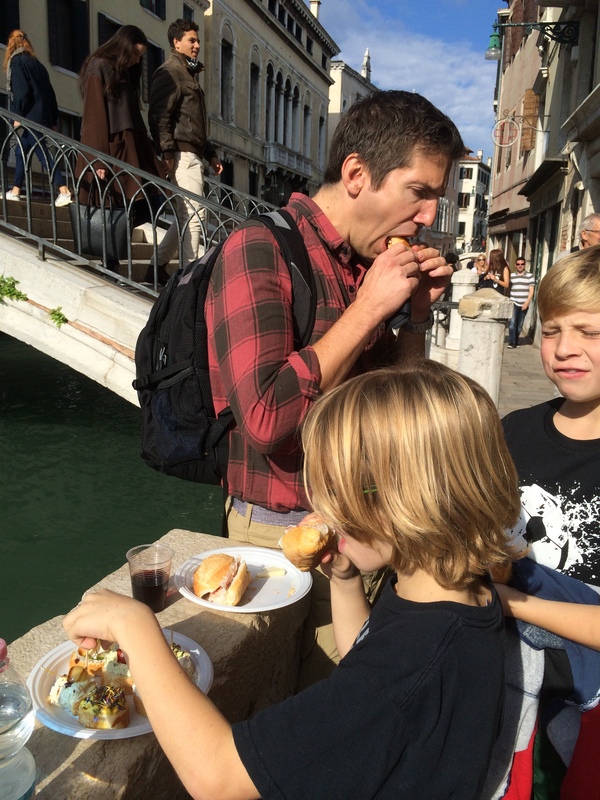 One of my favorite things was eating lunch the way the Venetians do – getting little snacks (“ciccheti”) and some wine and eating standing up outside. Other than that, even with restaurant recommendations, we managed to eat mediocre food with bad service. I am glad we went to Venice, but I do not think I will make a point to go again. Another tip: if you drive, be sure to reserve a parking spot in advance, especially if you go in the summer. FLORENCE. 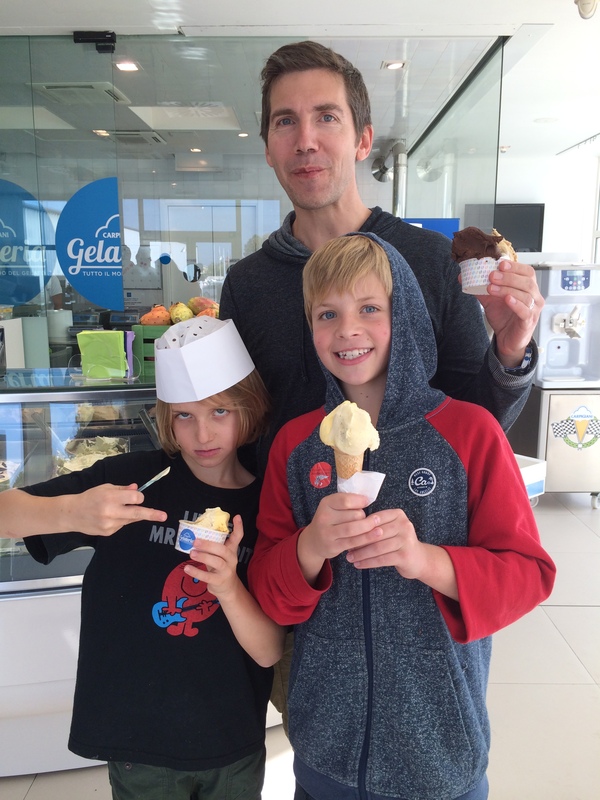 While we ran out of time to go into Bologna on the way, we did stop at a Gelato Museum/Factory just outside the city for a tour and gelato-making lesson (reservation required). Fun! Thanks to the New York Times for the tip. 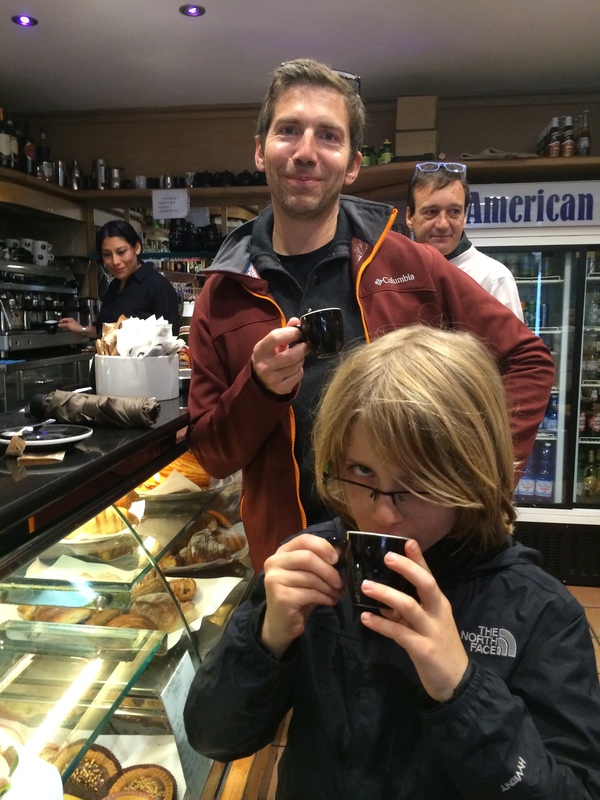 The first thing we did in Florence was a highlight of the whole trip. Long story, but in a nutshell: my great-grandfather, two great-great-grandfathers, a great-great-grandmother, a great-great-great-grandmother are all buried in what was a non-Catholic cemetery in Florence. 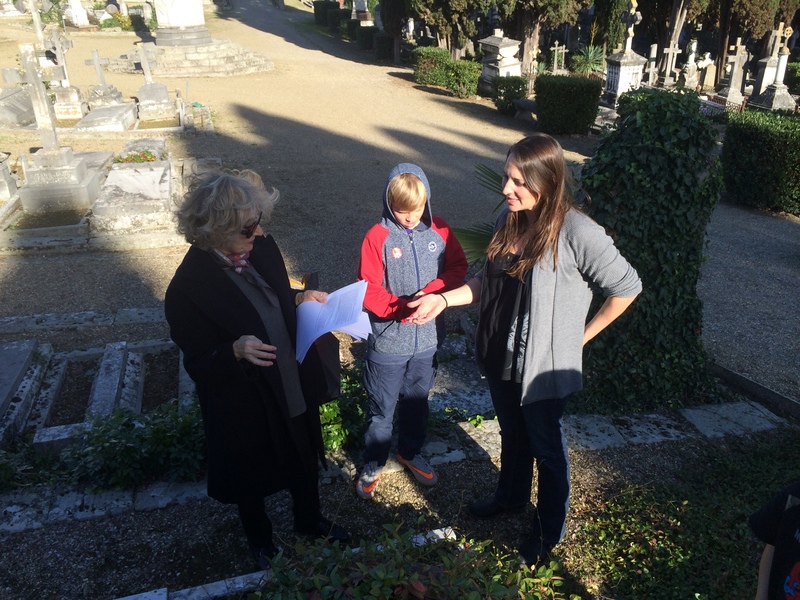 I happened across some research that a Florence-based professor had done on the cemetery that mentioned my family members, got in touch with her, and she met us there. She was absolutely delightful and had pages of research on my family members and the cemetery – what a special experience for us. Even if we had known about the cemetery, we would never have been able to find the graves, some of which were in pretty bad condition. It was a very meaningful way for us to connect to Florence and begin our visit there. Afterwards, we were stymied by the Zono Traffico Limitado (see ITALY PART I) and ended up parking 50,000 miles away, but we finally arrived at the adorable AirBnB in a convenient location yet in a “real” neighborhood and away from the hordes of tourists. The kind host subsequently accompanied me to repark our car in a FREE parking zone very close by (behind Boboli Gardens)! Awesome. Anyway, I love Florence – THE epicenter of the Renaissance – and we could have spent even more than two days/three nights there… but even there, we were shocked by the tourist crowds. Getting tickets ahead of time to the Uffizi and the Accademia (to see the David) was critical. Best things we did in Florence: 1. 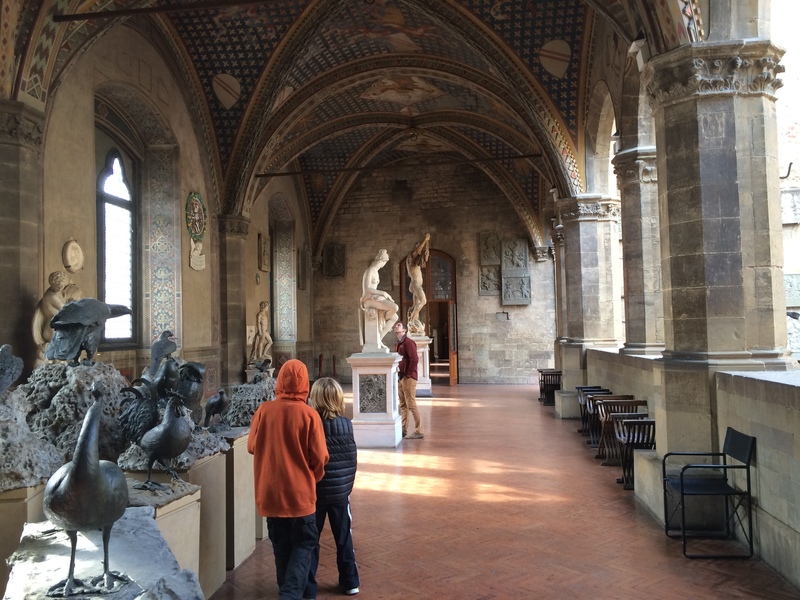 The Bargello museum, which guidebooks and people say is “not a priority.” (advance tickets are not necessary because of this). 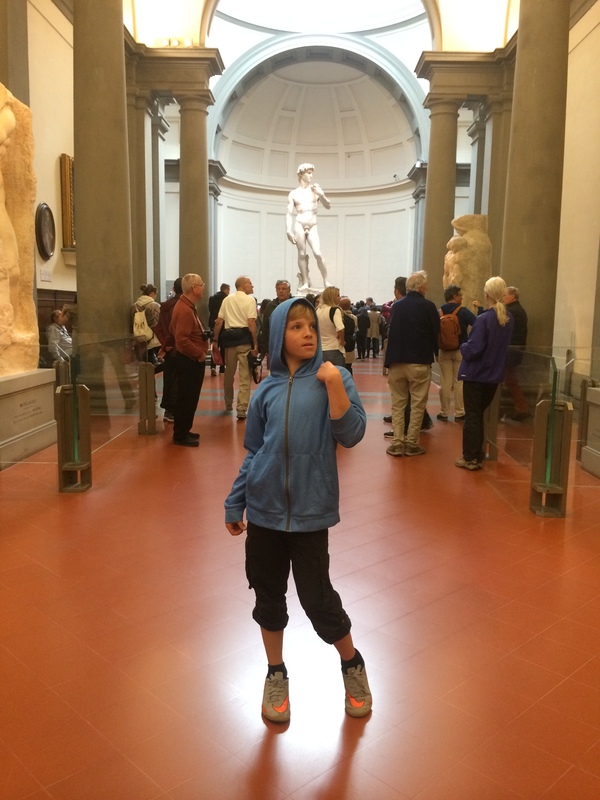 We loved it – it’s a beautiful setting, no crowds, and the kids truly enjoyed the sculpture (due to their knowledge of Greek & Roman gods thanks to Percy Jackson) and the suits of armor and weapons collection. 2. 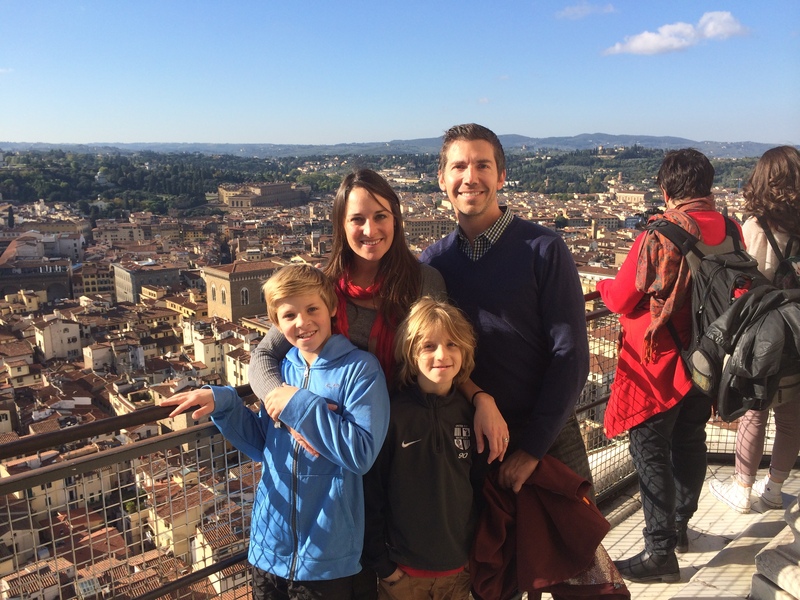 Climbing the Duomo – worth getting here early (or right before it closes). 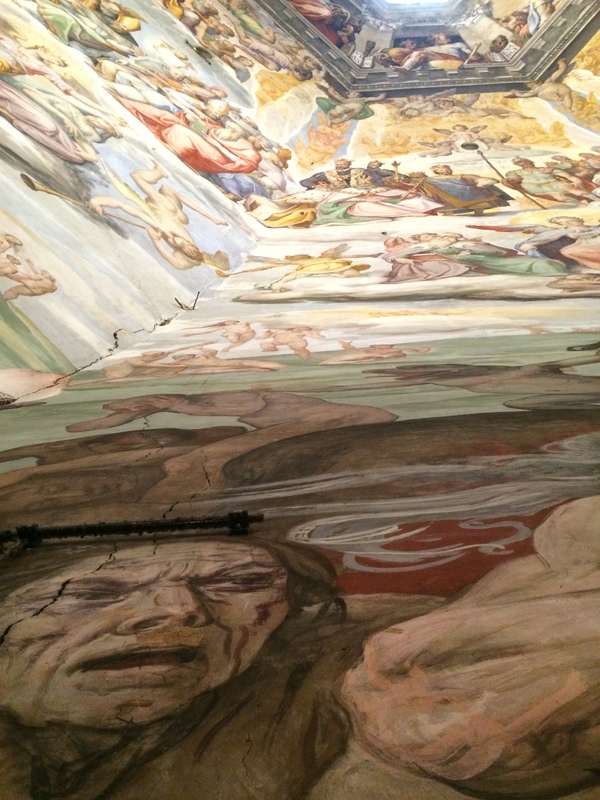 The views are great from the top, but even better is getting to see the gorgeous frescoes on the inside of the Dome up close. PapaHatch and I are enjoying reading Brunelleschi’s Dome, by Ross King, to get a better sense of the amazing structure (a more interesting and engaging read that it sounds). 3. The Mercato Centrale, which has wonderful mini-restaurants within it for lunch as well as bright, colorful fruits and vegetables and other market offerings. 4. 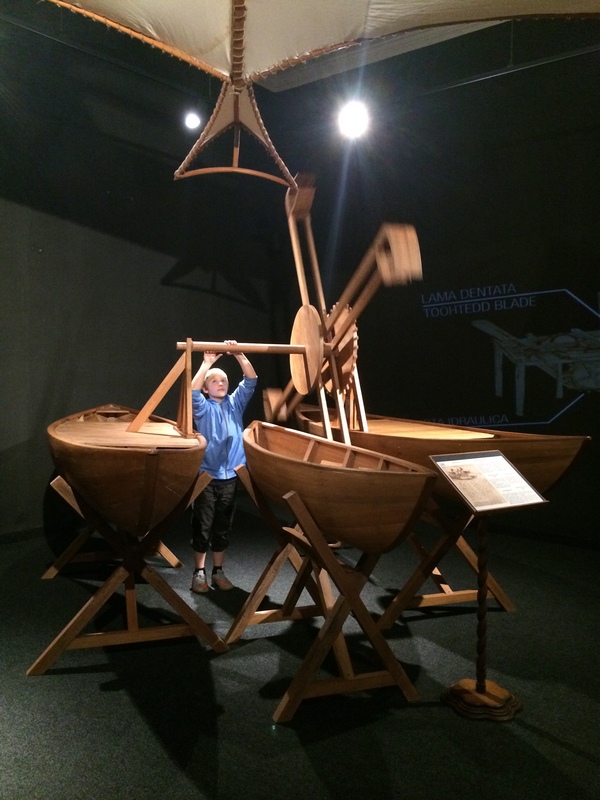 The Leonardo da Vinci Museum, while not the best museum I’ve ever seen, was a lot of fun for the kids. They loved seeing the life-size models (that you could touch!) of LDV’s innovative scientific designs, many of which are still in use today. The breadth of this guy’s interests, imagination and skills is incredible – a true Renaissance man and genius. The David and The Fritz. TUSCANY. 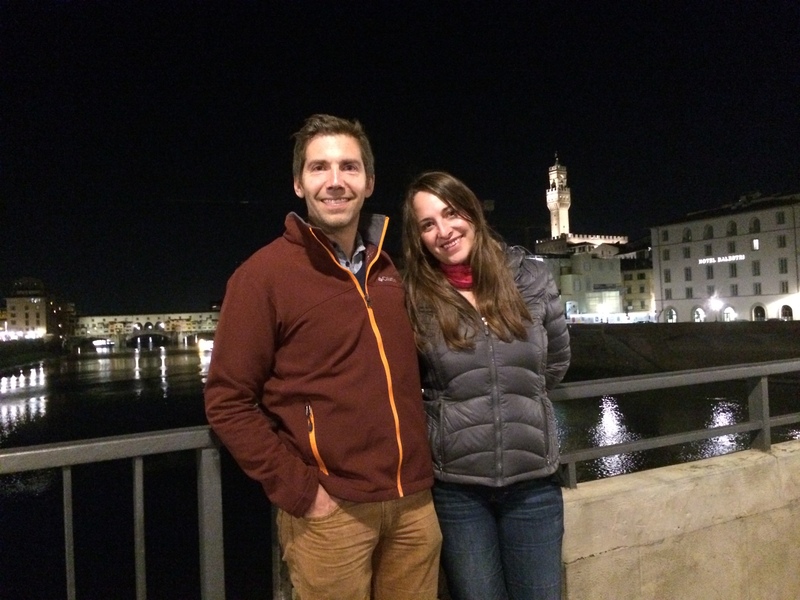 My sister, who lived in Italy for almost 20 years, gave us some fantastic tips for our whole trip (thanks so much, S.!). 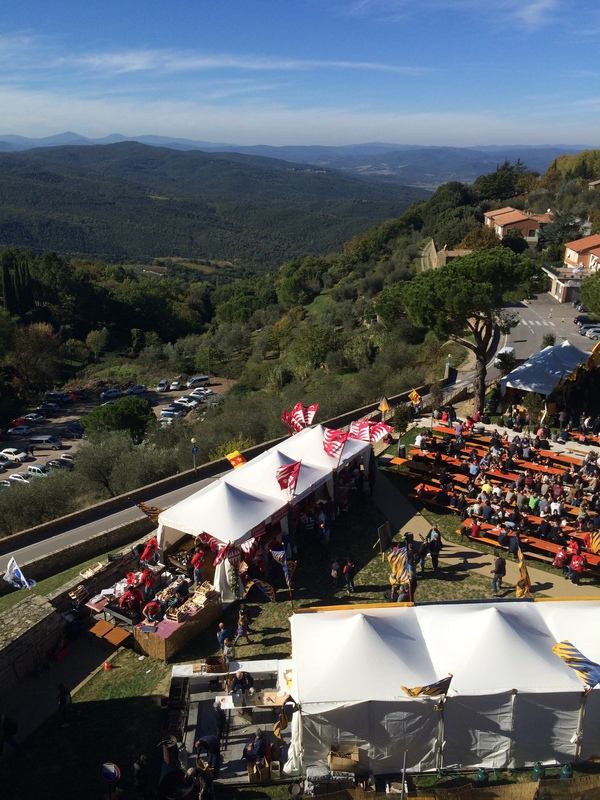 The best was to alert me to a festival – La Sagra del Tordo (festival of the thrush) – that would be going on in Montalcino right when we’d be traveling. It was so cool! 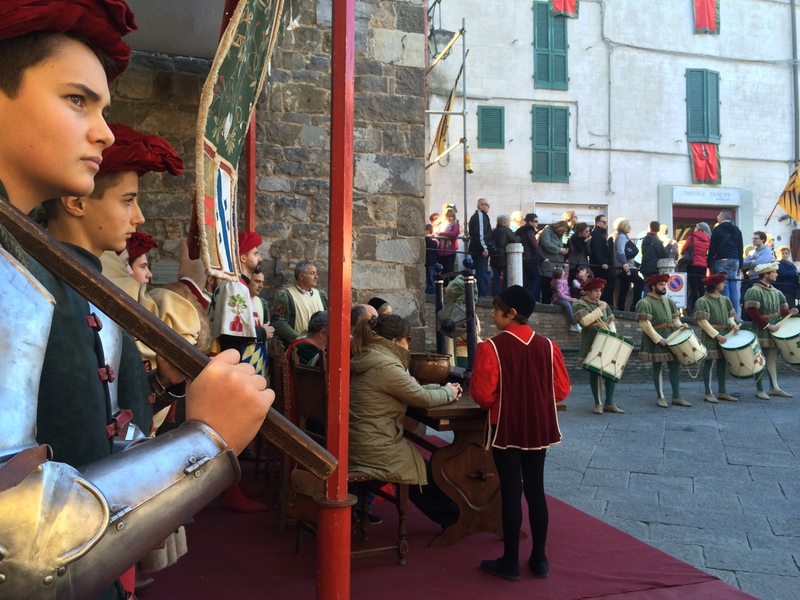 The festival itself was a lot of fun – the basic “festival formula” throughout Tuscany from what I gather is a competition between the historical four quarters of the town. In this case, three archers were selected from each quarter to compete against each other, thankfully hitting a fake wild boar rather than real thrushes. Completing the picture were traditional dances and food booths from each quarter serving great food and wine with a gorgeous hill country view. 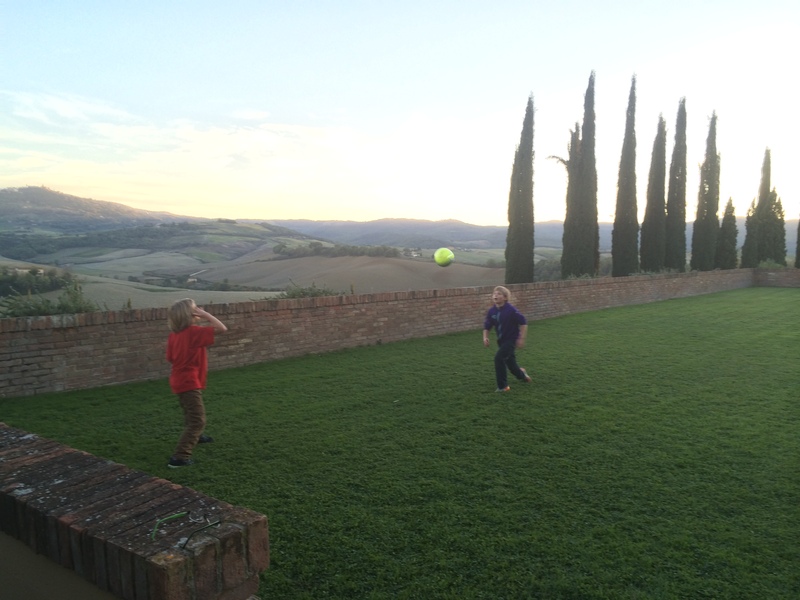 The boys decided we would each cheer for a different quarter (go Borghetto!). Montalcino is known primarily for its terrific red wine, called Brunello. 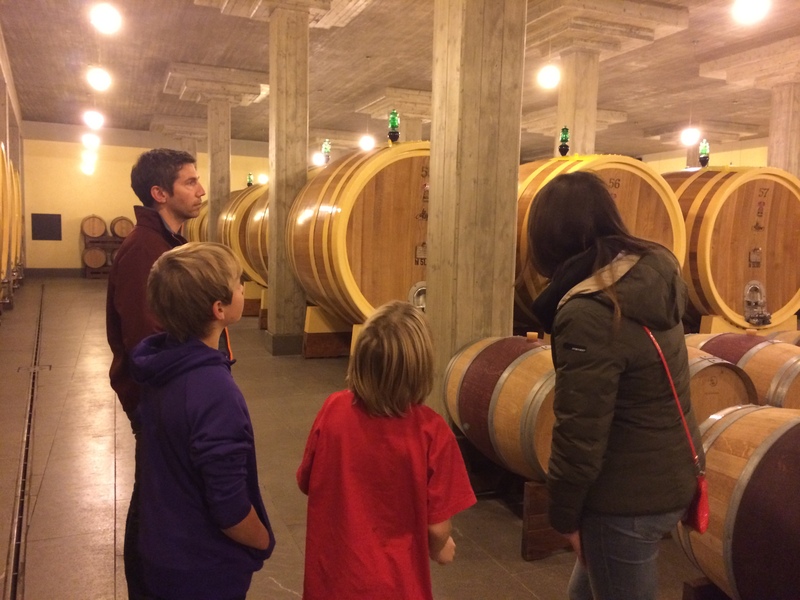 We had a lovely tour and tasting at beautiful Altesino nearby – a better choice for us than the busy & more commercial Banfi winery. The boys enjoyed the accompanying snacks (one also enjoyed the wine!). 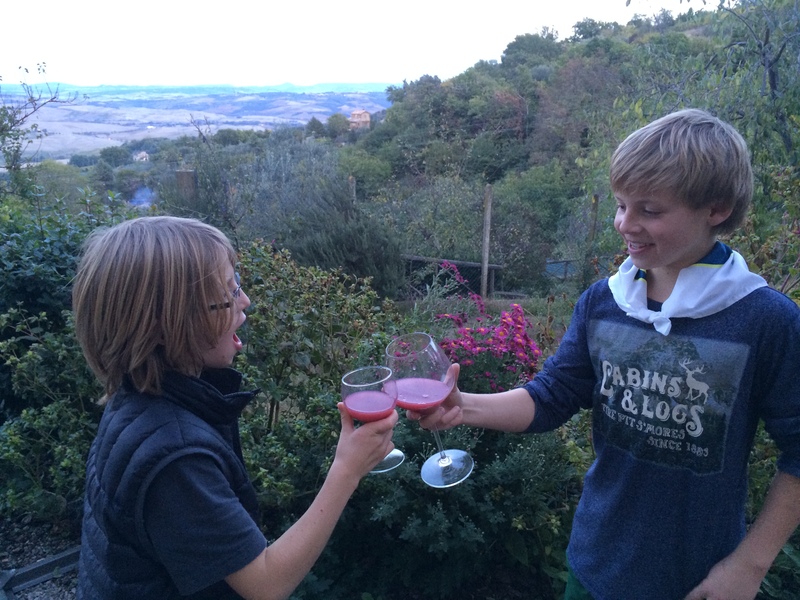 They were inspired to later make their own version of Brunello with leftover San Giovese grapes in the vineyard next door to our lodging. We also had short but pleasant visits in San Gimignano and Montepulciano, appreciating the relative lack of crowds compared to what they are like in the summer. Two of our best meals were in these two towns, the favorite at Montepulciano’s Osteria del Borgo: gnocchi al guanciale di cinta con pomodorini e menta (gnocchi with local bacon, cherry tomatoes and subtle mint) – out of this world. 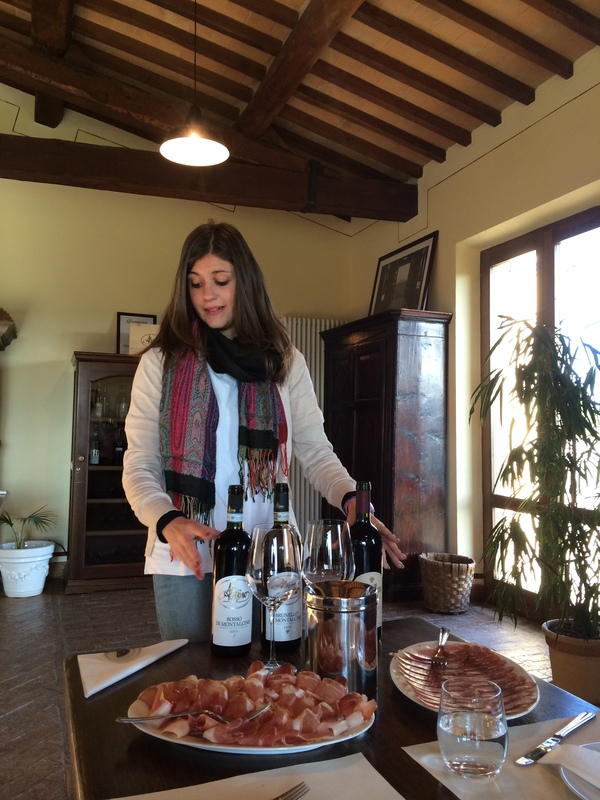 Altesino tasting… yes, we bought a case! ORVIETO. 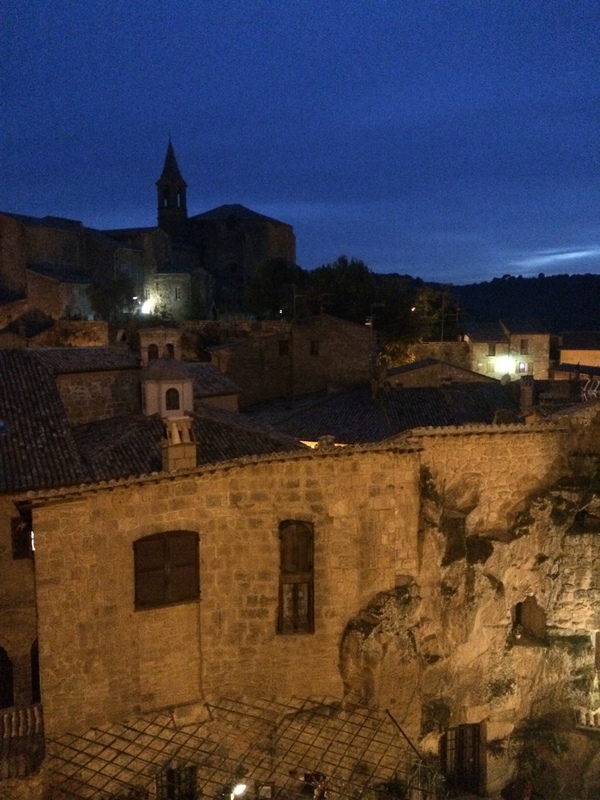 Our stay in beautiful Orvieto was way too short. Our AirBnB was fantastic, with its own ancient Etruscan cave inside (really! ), and the town was atmospheric and lively. Yes, there were tourists, but they were mostly Italian, and we still managed to get a sense of the local life. 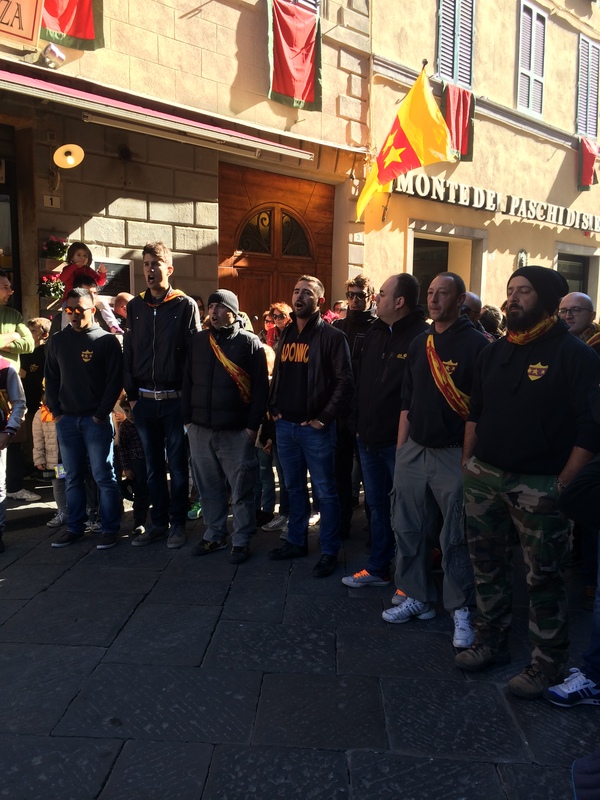 We enjoyed watching the “passeggiata” – evening stroll – of residents and visitors alike. We would love to return. ROME. We stayed in a great neighborhood here, the old Jewish ghetto. Now full of restaurants, it has its own pre-Roman ruins, retains a cool, unique character and is very convenient. It also has a fascinating and, of course, tragic history. Jews actually came to Rome directly from Israel in the second century B.C. – before the Diaspora. The Jewish ghetto was created by the Pope in 1555; Jews were forced to live within its walls (locked in at night!) for three hundred years – only really experiencing full rights in 1870 when Italy became a unified country. 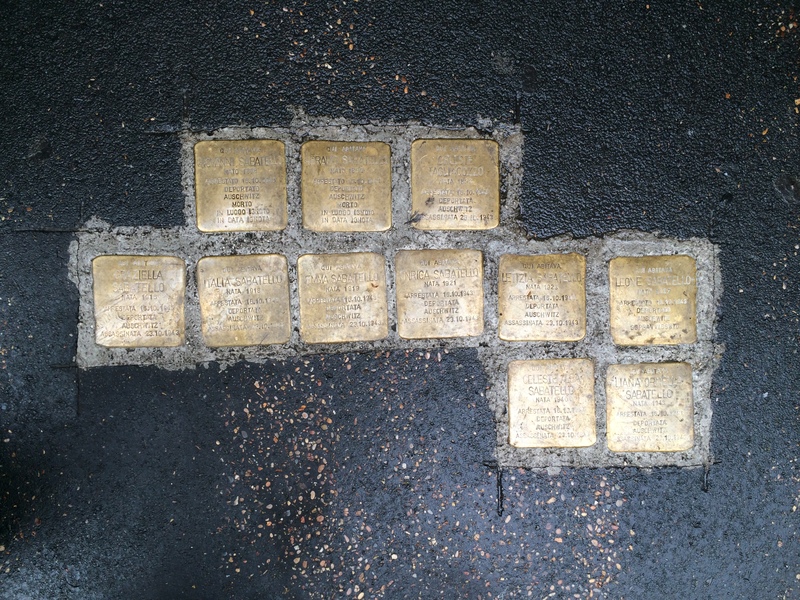 When the Nazis came through in October, 1943, they deported 2000 Jews to concentration camps. Only sixteen returned. Seeing memorial plaques set in the sidewalks around the neighborhood and on the school wall, while at the same time hearing present-day schoolchildren laugh and chatter within their school walls was very moving. Again, reservations in Rome were essential – for the Colosseum & Forum (same ticket) and for the Vatican. Even with tickets, I highly recommend getting to the Colosseum when it opens, as it filled up pretty quickly with giant tour groups who naturally congregate right in the middle of the narrowest passageways. The Forum is a little more spread out, but here’s where a walking tour is very helpful, as it’s pretty uninteresting unless you know what you’re looking at – and then it’s awe-inspiring. 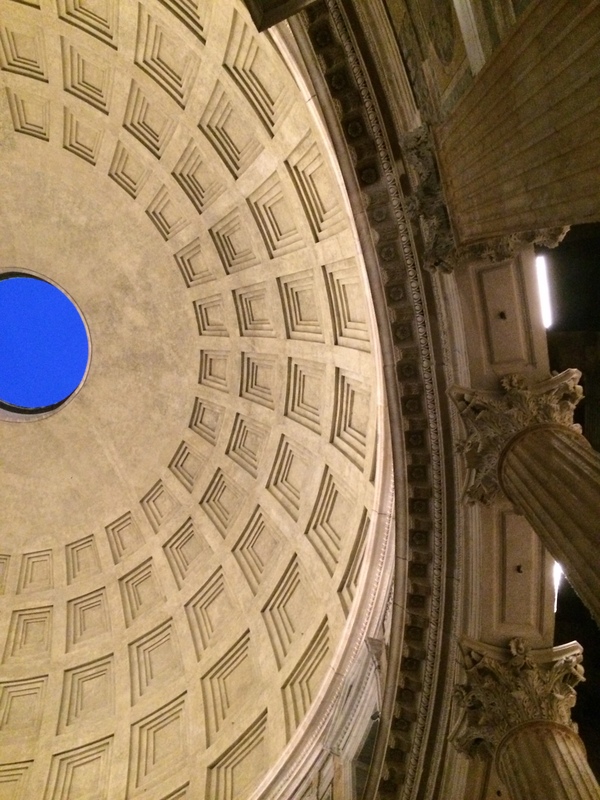 We LOVED the Pantheon… it’s free and while crowded, no line per se (at least in October). 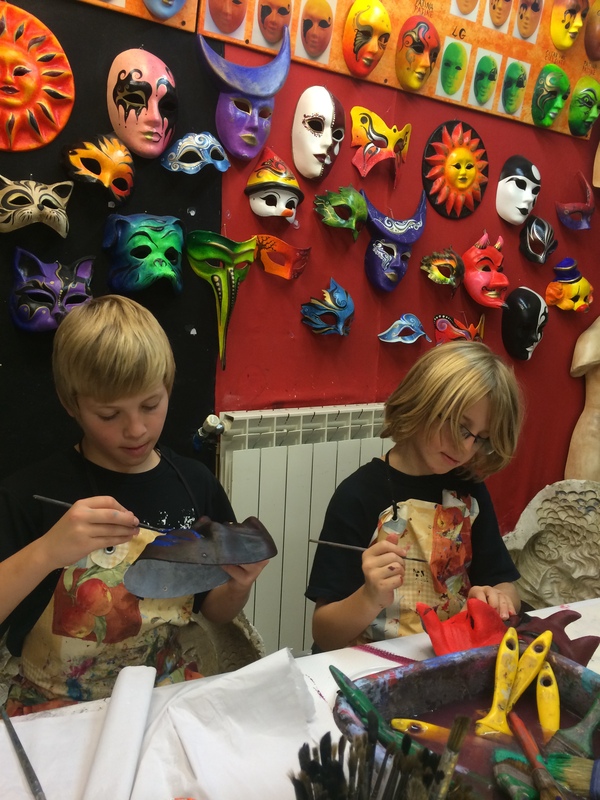 We “splurged” on the €2 video machine tour for the boys – they liked it and learned a lot! 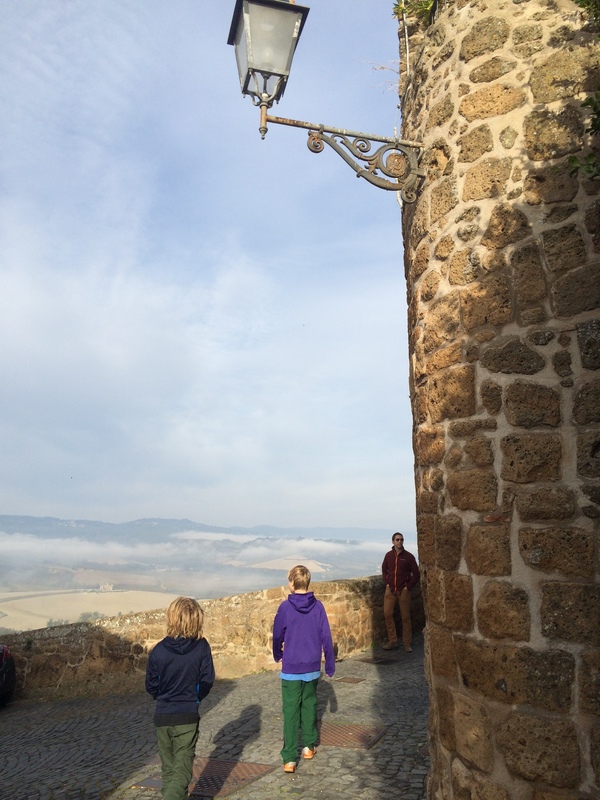 (and it kept them occupied while PapaHatch and I did the grown-up Rick Steves walking tour on my phone). The Vatican… well, we are not religious, so our pilgrimage was for the art. We didn’t even get to St. Peter’s itself due to the long line (not reserve-able in advance) and also because to get to the Sistine Chapel, you are forced to walk through literally miles of corridors, passing plenty of interesting things, but it’s just way too much with way too many people. 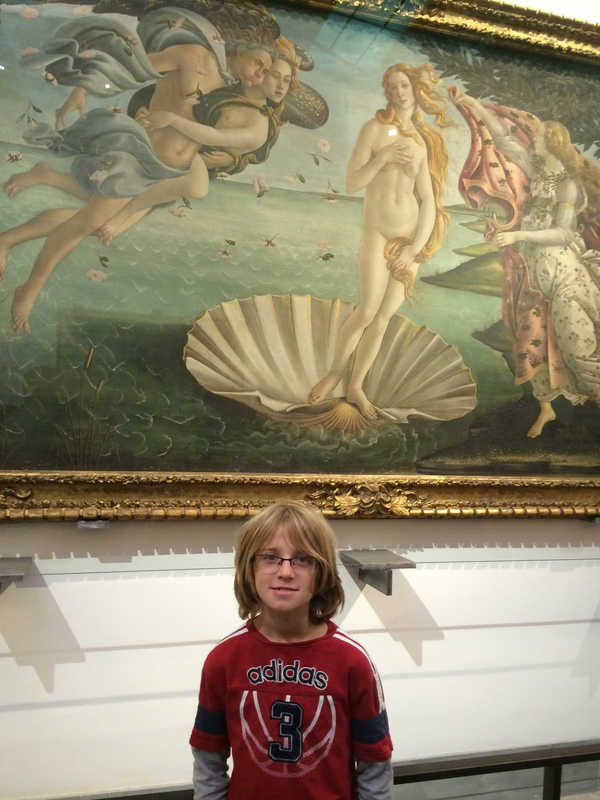 Honestly, I was the most excited by the more modern art collection close to the end (the end being the Sistine Chapel), but by that point, we were running on fumes and the promise of gelato for good behavior. 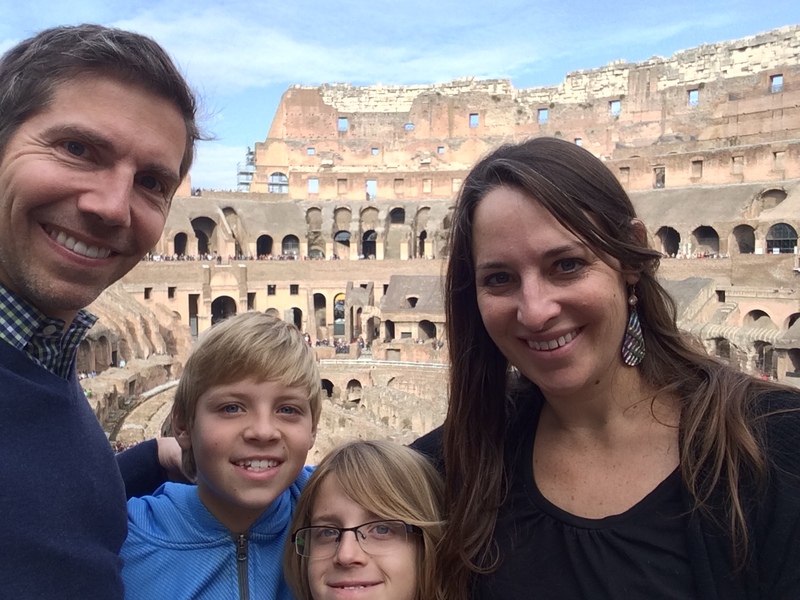 TIPS: do not do the Vatican and the Colosseum & Forum all on the same day. We DID do this, but only because I already had Vatican tickets for a specific day & time and the forecast called for rain on my planned Colosseum/Forum day. It was very tiring to do this all in one day, although I’m really glad we pushed through… the Forum in the rain would have been a bummer. Also, the Vatican is far from the Forum area and where we were staying; after all that walking there and through it, we wanted to take a taxi back, but even the official taxis refused to use their meters and were charging exorbitant inflated prices. We should have just figured out the bus system but instead, we walked all the way back and truly earned the awesome three scoops of gelato back in our neighborhood! One REALLY annoying thing in the Sistine Chapel (which in and of itself does not disappoint – it’s magnificent) is that the security guards literally shout the entire time “SILENCIO! NO PHOTOS! SILENCIO!” – which is funny for about 5 seconds and then is just irritating and distracts from the beauty of the masterpiece. 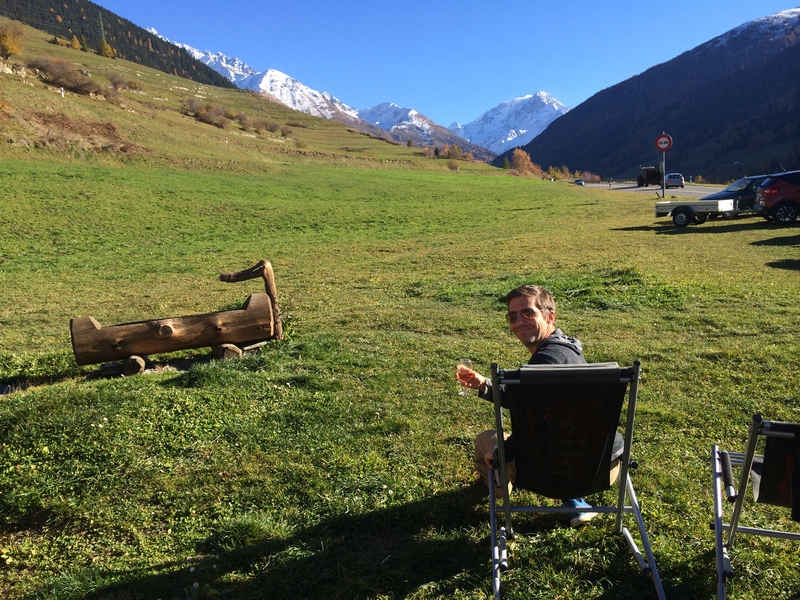 Having crammed the key sites into the non-rainy day, we had a leisurely third day. The main event was to head back toward the Colosseum area to see the Basilica of San Clemente, which is really cool. 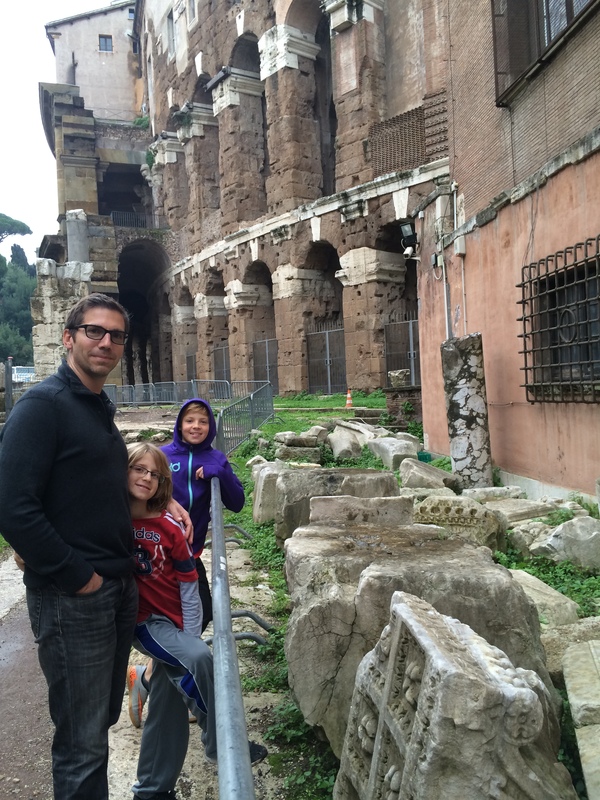 (I wish we’d had time to do it before or after the Colosseum, as it was kind of far to walk in the rain). Anyway, the church dates from the 1100s but is built on the foundation of a 4th century church, which is built on the foundation of a 1st century home/church. We loved it. 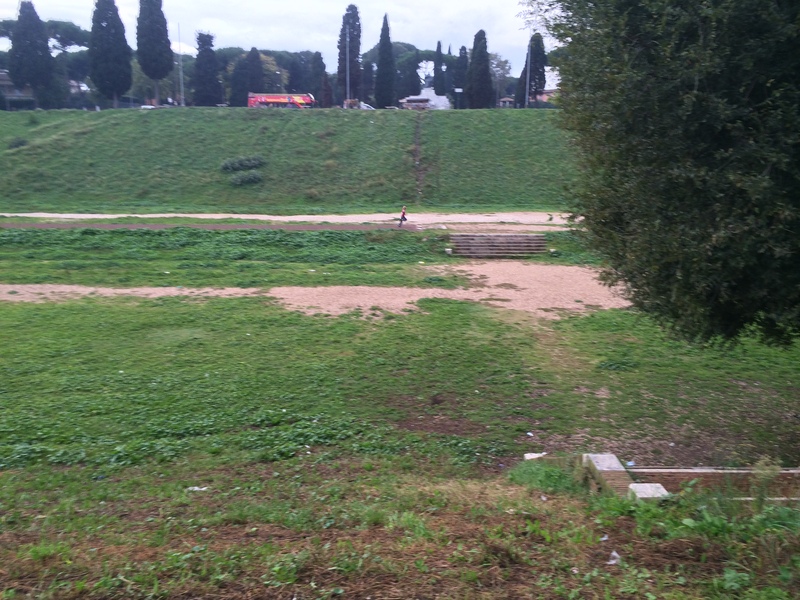 We walked back via the Circus Maximus, where Ernest proceeded to run several races (sans chariot). We all really enjoyed Rome and found the Romans friendly and charming. There aren’t the vast array of museums you find in Paris, but the ones they do have are important and amazing, especially the ruins – including the ones that you come across randomly that seem to be around every corner. 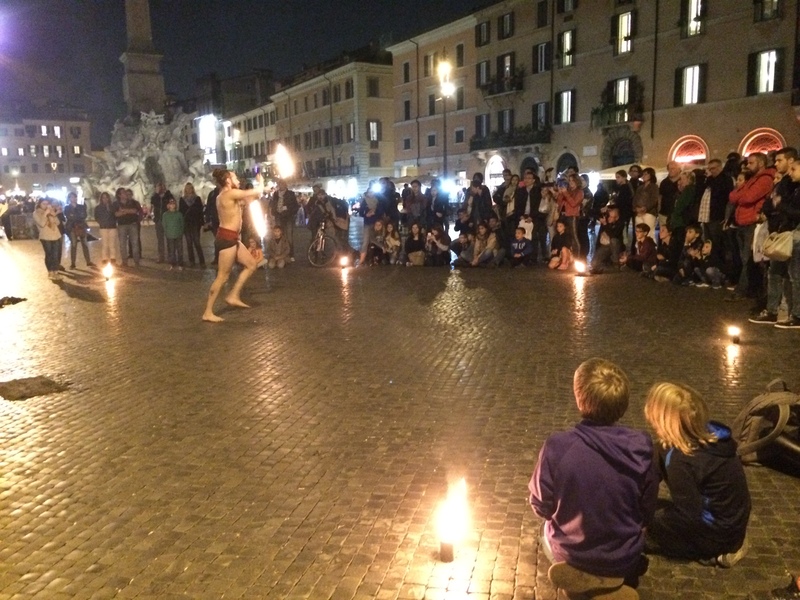 Rome also seems really livable, and it’s really fun to walk around, grab an espresso standing up at a bar, join in the passeggiata at the Campo de’ Fiori or watch a fire dancer at the Piazza Navona. We left Rome for a long day of driving up the coast, stopping for a seafood lunch on the beach. We had planned to make a super-quick stop in Pisa to take the obligatory holding-up-the-leaning-tower picture, but after some belated research, we realized that we’d have to park outside the ZTL and take a shuttle to the tower. Sadly, that was extra time we didn’t have this trip. As it was, we tended to arrive to our destinations just before sunset, and I really didn’t want to have to navigate windy coastal roads in the dark. Ernst likes wine and coffee. He’s NINE. CINQUE TERRE. 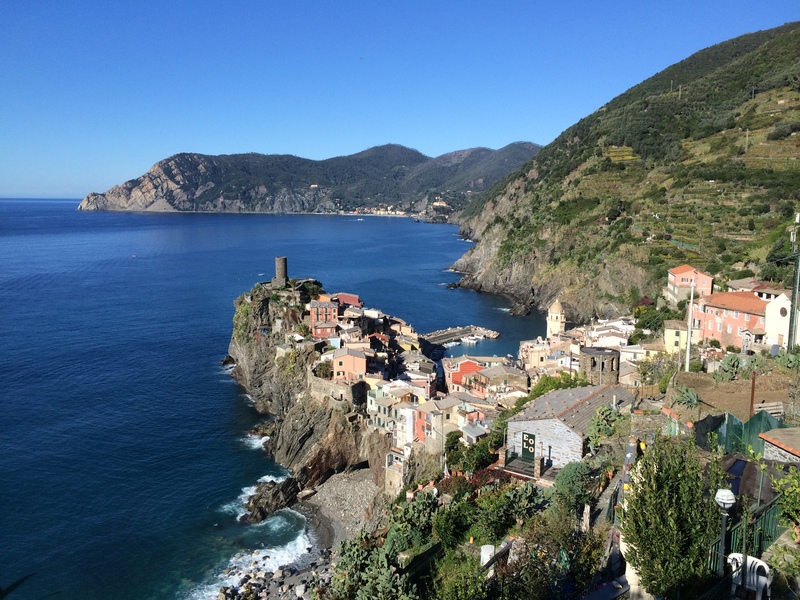 Ah, Cinque Terre (the 5 lands)… beautiful, touristy, not as polished as the Amalfi Coast (or so I hear), and very difficult to get to by car. We did not have the luxury of time here (we were doing the long drive back up to Switzerland, albeit this time along the pretty coastal areas). 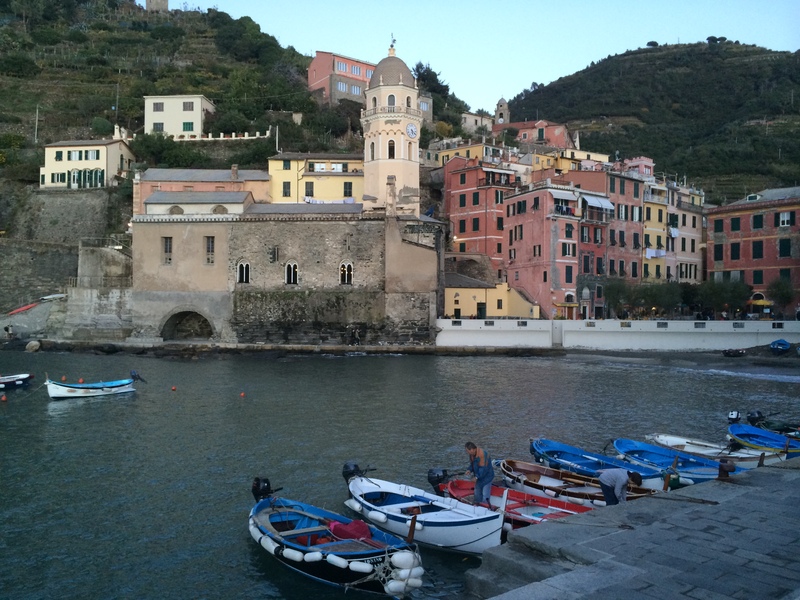 We stayed in Vernazza, called the “poster child” of Cinque Terre. A mere four years ago, at this exact time of year, it was devastated by the worst flooding in its history – 22 inches of water in four hours, damaging virtually all the buildings in the town with ten feet of mud and taking the lives of three residents. Today, you wouldn’t guess it, but knowing the history gave us a real appreciation for the town as more than just a pretty touristic stop. After a herculean community rebuilding effort, now the locals were all around, just living their lives – fishermen taking their boats out to sea, older women heading to daily mass at the seaside church, old men sitting on benches shooting the breeze, multiple generations hanging out with each other in the town square. They seemed to live in harmony with the tourists who invade their small village on a daily basis (it must be almost unbearable in the summer)… but perhaps the 2011 devastation really brought home the importance of tourist dollars to their survival. Regardless, they were surprisingly serene and generous with their smiles and greetings. I felt for them – supposedly, most of the families have lived there for generations, and I kept thinking how in just the last few decades, how much has changed for them (many credit/blame the Rick Steves effect). Tourism is a selfish but addictive beast. Apparently, Vernazza and the other four villages have tried to resist the lure of “selling out” (I guess it’s all relative); it’s true that the roads are pretty terrible and scary. If you plan to visit, I agree that the train is better (park at one of the villages and hike or take the train to the others). We parked… in the only lot available to non-residents, about ¾ of a mile UP the mountain. 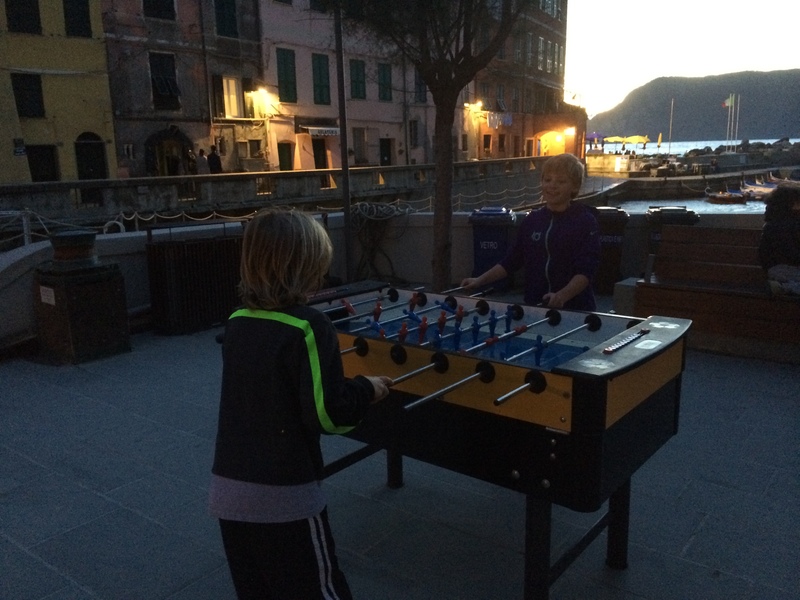 Worth it for us – we had perfect weather, a nice hike, a great meal (Belforte Restaurant) and really enjoyed the vibe of Vernazza. ALBA. 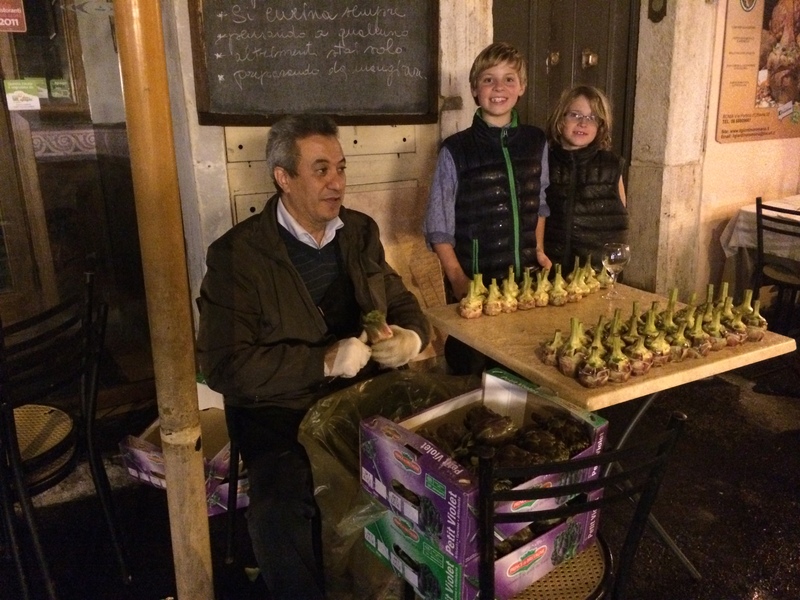 From Cinque Terre, we headed north to Alba – host of an annual month-long truffle festival (the fungus not chocolate) and a perfect stopping point for our last night. 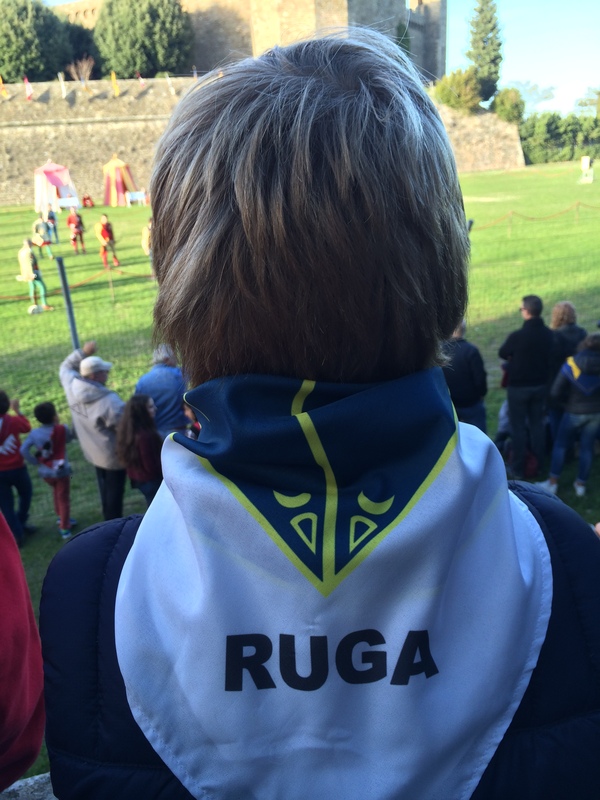 Friday evening was fantastic in Alba! Almost no foreign tourists, but plenty of people enjoying their passaggiata down the pedestrian-only streets. 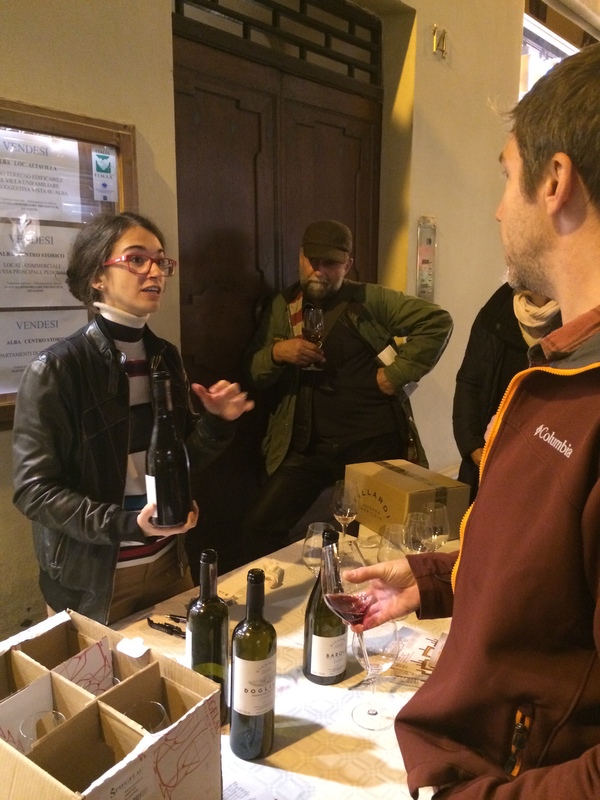 About ten wineries or shops had tables set up for free tastings to all passersby; we had such a good Barolo (from right down the road – the Azienda Agricola Gillardi) that we bought two bottles on the spot. 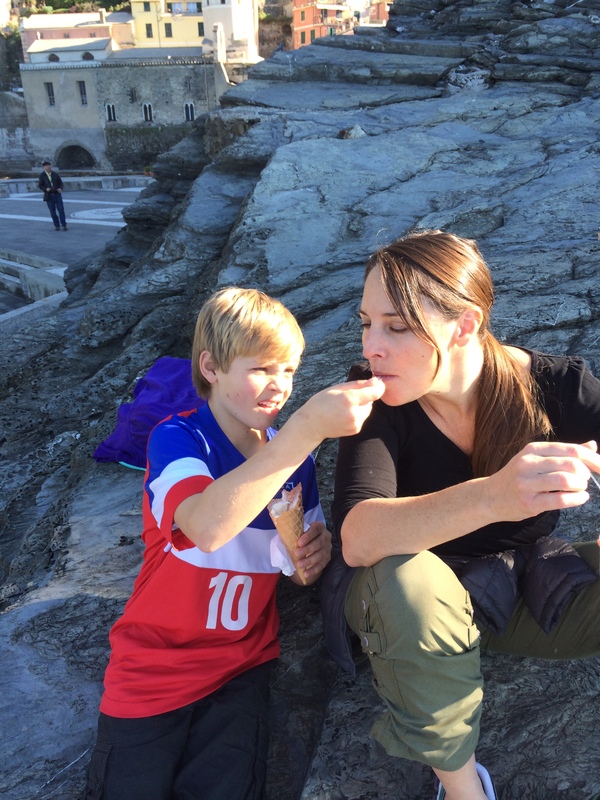 It didn’t hurt that the scent of truffles pervades the city. 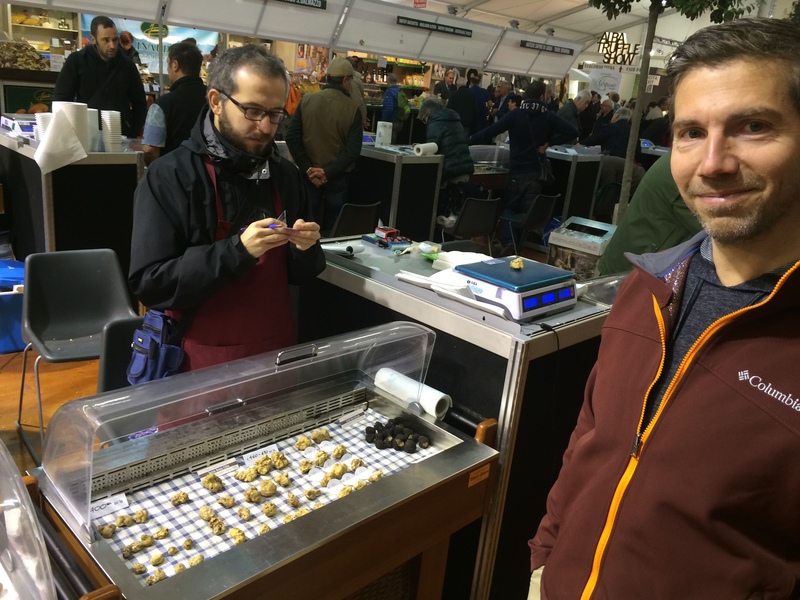 We hit the truffle festival the next morning… along with an influx of the all-too-familiar tour groups, although Alba is enough off the beaten path that it was bearable. The festival was something to see! All those high-priced truffles and other local products (olive oils, balsamic vinegars, fresh and dried pastas, pesto, hazelnuts and hazelnut-flavored things). I had been really excited to have eggs with shaved truffle on it – yum! – until I saw the price: €4 for the egg, €40 to add the shaved truffle. You know what? I’m good just smelling it for free. 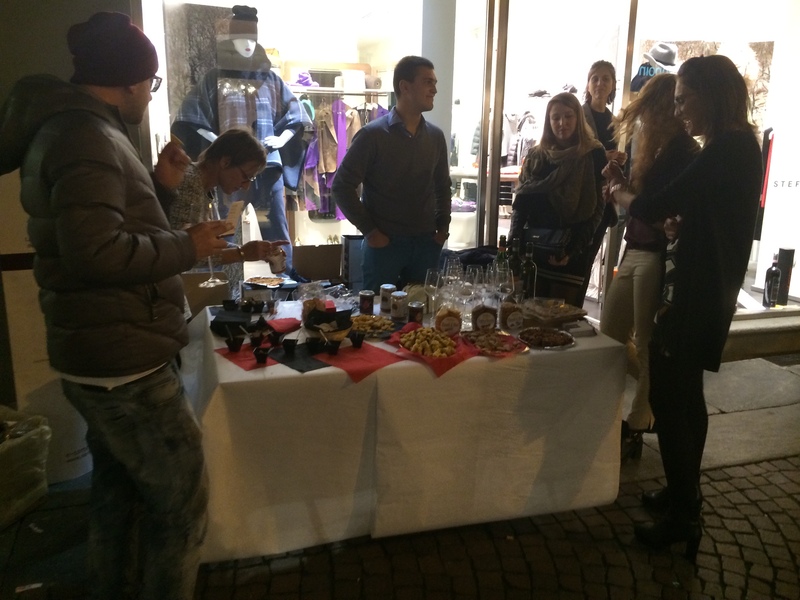 Free wine & snacks during the passeggiata in Alba – fun! Wonderful Gillardi Barolo. Bought some. 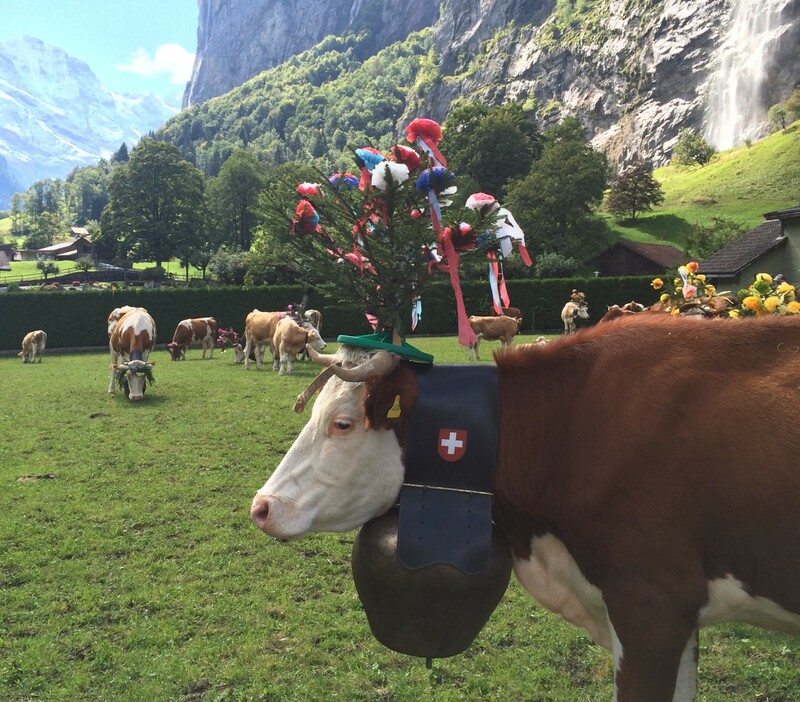 The Alps glowing bright with splendor… ok I did Google the Swiss national anthem after all. Such a kind thing to say! Thank you! And I can’t wait to hear what plans you may have brewing… it really is worth the planning & visa hoops. Thank you so much for the wonderful blog. I keep going back and enjoying the past entries. 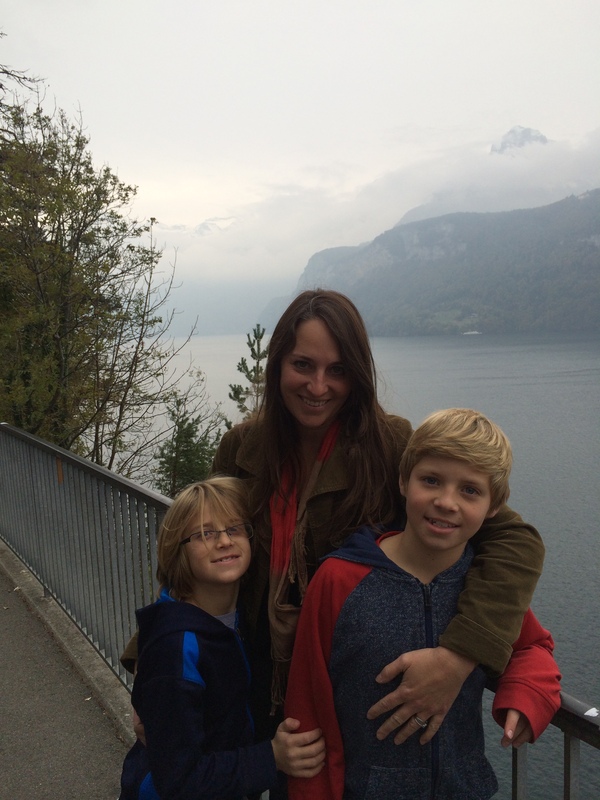 Business Travel… with a side of Leisure?